For the best part of six decades, Elizabeth Stewart, singer, pianist, composer and storyteller, has championed and perpetuated the vibrant store of song, music and lore nurtured by her traveller family over generations. She was born in 1939 in a croft in “the Dukker” – Duke Street in Fetterangus, one of four children in a “settled” traveller family in which the women in particular were doughty characters and vital tradition-bearers. Her mother, Jean Stewart, was a trained musician, teacher and a household name in Aberdeenshire as an accordionist and dance band leader who broadcast with the BBC, and while all the family were steeped in balladry and lore, her aunt, Lucy Stewart, possessed a particularly rich store. This musical genealogy also included a male lineage of champion military pipers, some of whom perished in the First World War). Behind them all were the redoubtable figures of her grandmother, “Auld Betty” Stewart, her husband Jimmsy Stewart and his father “Auld Crichie” Donald, both great pipers and fiddlers. Betty brought up a family of 14, rag-gathering and hawking to pay for music lessons. Elizabeth inherited her musicality especially from her mother and from Lucy Stewart, from whom she absorbed a wealth of song and lore, particularly the “muckle sangs” which remain in her repertoire, just as Lucy had learned them from Auld Betty. Among other things, Elizabeth absorbed many ballads and tales of the supernatural which have remained a strand of her repertoire –The Cruel Mither, for instance, which she says terrified her when she first heard it from her aunt. She also composed ballads of her own, such as Lord Gordon’s Bonny Boys and Cruel Edwin, the latter inspired by a particularly haunting true story, which Lucy and Betty had learned from the woman involved. Not only does she give authoritative voice to one of greatest north-east songs, The Battle of Harlaw, but she can also tell of a ghostly encounter involving her grandparents when they, perhaps unwisely, camped on the traditional site of the battle. In 1954, the roving song collector and folk revival activist Hamish Henderson arrived at the family’s home in Fetterangus, recorded Lucy and went on to introduce other folklorists, such as Peter Kennedy, Alan Lomax and Kenneth Goldstein. Goldstein’s intensive recording of the family and particularly Lucy, releasing a record of her singing Child Ballads on the Folkways label, caused the reputation of the Fetterangus Stewarts to burgeon, and Elizabeth found herself in increasing demand as a singer and musician. At 14, she was playing piano arrangements of pipe matches on the radio, but was deemed by her family to be too young to tour Canada at the invitation of the great bandleader Bobby MacLeod. A few years later, however, she was in Birmingham, contributing to Singing the Fishing, one of the ground-breaking Radio Ballads series produced by Ewan MacColl, Charles Parker and Peggy Seeger. After a period of more local appearances and running clubs while she brought up her children, in 1972 Elizabeth was invited to appear at music festival in North Carolina, and ended up touring schools and universities across 18 states, the first of several American visits. Back at home she has been a keen supporter of TMSA festivals, as well as other song-orientated events such as the Cullerlie Singing Weekend, and has given presentations and masterclasses to students on the Scottish Music Degree course at the RSAMD (now the Royal Scottish Conservatoire). Her songs and music have been recorded on two albums, Atween You and Me in 1992 and the double album Binorrie in 2004. She also contributed her version of the great battle ballad to Harlaw: Scotland 1411, released by Bonnie Rideout and John Purser to mark the 600th anniversary of the debacle. Elizabeth’s musical input and tastes aren’t entirely traditional by any means: adept at transposing pipe tunes to the piano, in her youth she wasn’t averse to Jerry Lee Lewis and Winifred Atwell-style boogie-woogie. Above all, however, she describes her family’s rich musical heritage as “top priority”. 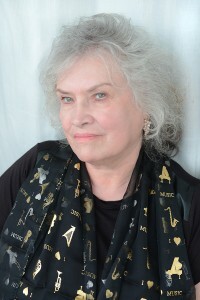 In the words of singer and musicologist Alison McMorland, who compiled and edited Stewart’s book about her family and their music, Up Yon Wide and Lonely Glen (2012), she feels “an immense responsibility to honour her ancestral and close family”, She is also, says McMorland, a performer “who gives of herself in her singing. You can hear the artistry of herself and her mother in it”.